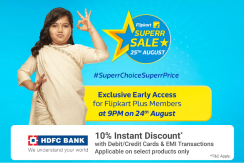 Flipkart is back again with its Flipkart Superr Sale on Aug 25, 2018 Superr Choice Superr Price. exclusive early access for Flipkart Plus Members at 9 PM Aug 24, 2018 . Get 10% extra instant discount with HDFC Debit , Credit Cars and EMI Transactions. How to Buy from Flipkart Superr Sale Aug 25, 2018?